“In MBA education we all talk a lot about leadership. A key consideration for us as educators is how we can help students understand their personal and leadership abilities. Of course, during an MBA, students discover a lot about themselves and how they interact with others. Working with peers in tutor groups, exercises and on projects all develop aspects of leadership and ways of working. However, I feel strongly that these situations can become routine, familiar, and safe. We wanted to discover, by putting our MBA students in an unfamiliar, risky, and wild environment, how we could look more deeply into the dynamics of leadership. That is why I found myself this Summer on top of a Norwegian plateau, Hardangervidda, with 17 of our students. By removing them from a business situation, the objective was to enable students to work from a shared and uniform understanding of a situation, something that is sometimes hard to achieve in an MBA classroom, with different professional skills and knowledge. As well as leadership, we were interested in how the expedition could develop resilience, self-reflection, and persistence. Some serious lifestyle adjustments were required. 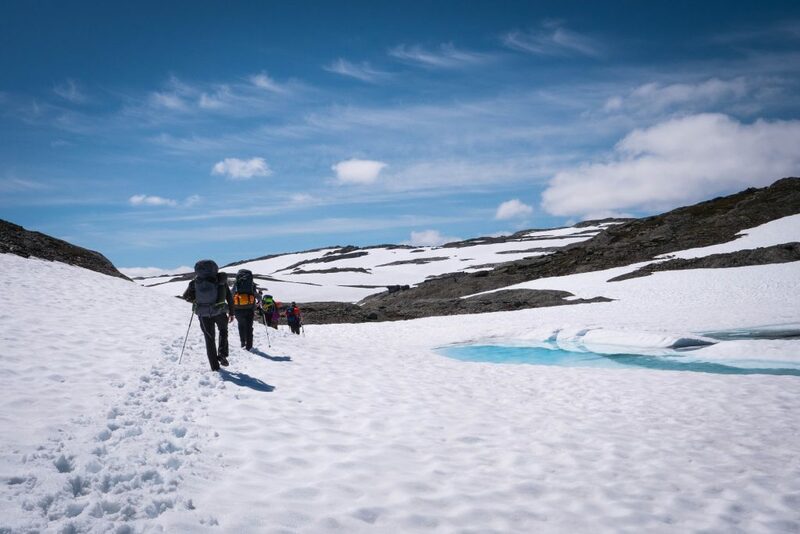 Over the six days, the students carried a 20kg pack over rough, snowy terrain with weather conditions changing between sun, fog, storm, and blizzards. They had to work together and learn to respect each other’s strengths and limitations, which provoked intense self-reflection, and a need for a deep understanding of others. The expedition commenced with a 360 assessment of five main components of leadership ability – confidence, competence, compassion, courage, and character, allowing the students to plan on how to develop each one. This was supported by peer feedback and personal coaching, with a strong emphasis on the strengths and leadership experience everyone brought to the table. We gave students a high-level goal to cross the plateau between two points. No route was specified, so the four student groups had to figure this out for themselves. While each group had a leadership coach and an outdoor specialist with them to ensure that nothing serious went wrong, they did not intervene in the group’s decision making unless necessary. Each day, a different student acted as group leader, agreeing a leadership ‘style’ with the coach in advance. Using this style, the leader dealt with decisions like setting direction, choosing meal times, or agreeing a camp location. The leader also had to deal with numerous challenges as they happened, such as an unexpected storm warning that confined us to the tents for a whole day. Each evening the group would sit together with the leadership coach and outdoor specialist to reflect on what happened: how it felt to be led and to lead, what went well and what did not. At the end of the expedition, every student delivered a speech, reflecting on their experiences, learning and how they could apply to rest of their MBA. One of our MBA students Victoria Veber comments: “Norway was a completely unexpected adventure that certainly has changed me and my life in many ways. It enabled me to get to know my peers on a more personal level, sharing more than academic abilities inside a classroom. Our personal strengths and weaknesses were more visible, but the famous slogan “impossible is nothing” kept popping into my head thinking about how far we’d come. There is a real value in getting students out of the classroom into unusual situations to really test them, to develop leadership capabilities and enable a deep understanding of themselves. It was certainly an interesting experience all round and one we intend to repeat as a core part of our leadership offering. This entry was posted in Uncategorized by Jane Atkinson. Bookmark the permalink.